Monday was an emotional night at Marlins Park as Miami played its first game since losing teammate Jose Fernandez, but the Marlins pressed on with a moving tribute to the pitcher. They took the field at Marlins Park crying, struggling to maintain their composure on one of the most difficult nights in the history of the sport. 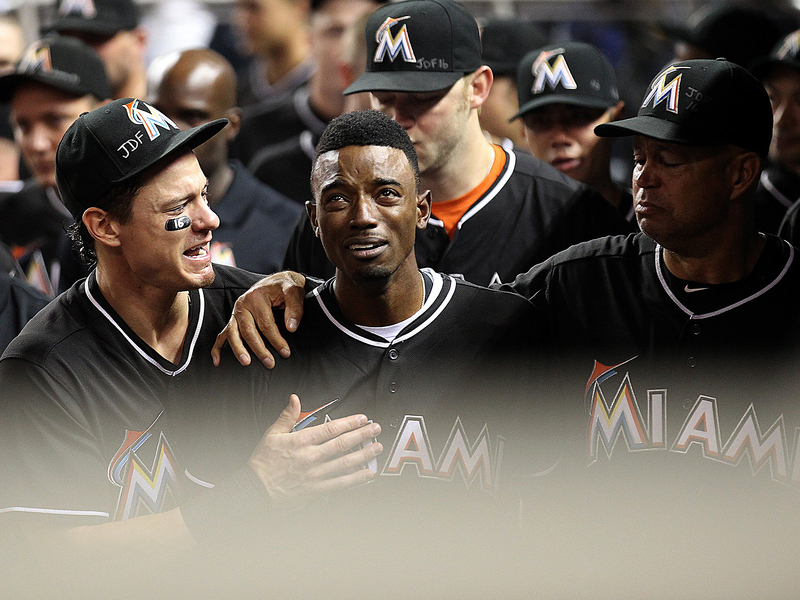 Tears streamed openly down the faces of Dee Gordon and Giancarlo Stanton; Marcell Ozuna buried his face into his hat and wept. Hands on their hearts, they stood around the pitcher’s mound, where “16” was painted on the dirt to represent the teammate they lost so unexpectedly. What should have been the final home start of Jose Fernandez’s season instead became a ceremony to mark the end of his life—a somber celebration of his career, of a young star taken away from the game and the world far too soon. “That was Jose’s mound today,” said Marlins starter Adam Conley to reporters after the game. On Sunday morning, the Marlins learned that Fernandez, their 24-year-old ace, had died in a boating accident on Miami Beach. For them, baseball came to a sudden and terrifying halt: Their scheduled game against the Braves was canceled, and a bewildered team was left to try to understand how Fernandez could be in the clubhouse one day and gone forever the next. But for all the grief that they and the rest of baseball felt over Fernandez’s death, the season had to go on. Monday night’s game against the Mets—one that Fernandez was supposed to start after being bumped from his scheduled turn on Sunday—had to be played, no matter how sad and surreal and downright inconsequential it seemed. There were tears and tributes all night: Video montages on the Jumbotron of Fernandez, a smile always on his face; a funereal pregame playing of “Take Me Out to the Ballgame” on a trumpet; a massive exchange of hugs on the field between the Mets and Marlins. Every Miami player wore Fernandez’s No. 16 jersey—a number that, team owner Jeffrey Loria said, will never again be worn by a Marlin. Before first pitch, the Marlins went over to the mound, bent over it and traced the initials “JF” into the dirt. The night’s best tribute came from Gordon, one of Fernandez’s closest friends on the team and whose face was streaked with tears throughout the game. Miami’s leadoff hitter, the lefty-swinging Gordon came to the plate against Bartolo Colon and stepped into the righthanded batter’s box—where Fernandez took his cuts—and perfectly mimicked Fernandez’s stance as the first pitch sailed in for a ball. Gordon stepped out, walked around the plate and took his usual place in the lefty batters box. Two pitches later, Colon left a fastball in the middle of the plate. Gordon swung, and out it went, flying high toward the upper deck in rightfield. The first at-bat of the Marlins’ life without Fernandez turned into the first home run of Gordon’s season, and as the crowd rose and cheered, Gordon rounded the bases, sobbing the whole time, then disappeared into a crush of hugs in the Miami dugout. “I told the boys, if you all don’t believe in God, you might want to start,” Gordon told reporters afterward. Neither the Marlins’ offense nor the emotions stopped there. Miami battered Colon in his brief outing, ripping line drives across the field. By the end of the second inning, it was 5–0 Marlins; they tacked on two more runs in the third, before the sheer weight of the evening and of what they had endured seemed to slow them down. Though the Mets rallied for a few runs late, they never made it close, and a parade of Marlins relievers kept them at bay en route to a 7–3 win. It was a defeat that hurt New York’s wild-card hopes, but as Mets manager Terry Collins said after the game, what had happened on that field was “bigger than baseball.” The sense of loss was overwhelming; the pain on the faces of Gordon and Stanton and Yoenis Cespedes was hard to bear. Every game from here on out matters for the Mets, but on Monday, the wild-card standings were a distant afterthought. Perhaps more than any other sport, baseball is fixated on the idea of taking things one day at a time. There is no room to linger; a season that long refuses to let you make too much of any one moment or get caught up on one game. It is a marathon, and it can sometimes feel like a slog, and it can seem impervious to interruption. The sun comes up, a game is played, the sun goes down, and the process is repeated over and over and over again, without fail, from the chilliest days of early April through the hottest days of the summer into the clear and cold evenings of October. The season refuses to stop; the players must press on, no matter what. After closer A.J. Ramos got the last out of the game, the Marlins once again assembled at the pitcher’s mound, where Gordon placed the game ball. One by one, they put their arms around each other’s shoulders—veterans and rookies, coaches and ballboys, men who had played with Fernandez for his whole, brief career and September callups who had only known him for days—and stood around the mound with tears in their eyes and bowed their heads as Stanton led them in a prayer. 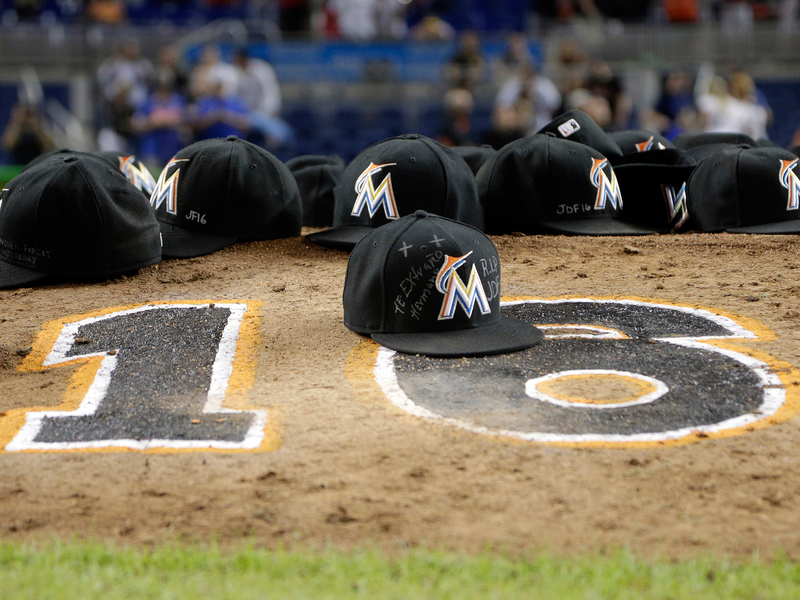 They took off their caps, most of which had Fernandez’s initials and number written on them, and threw them onto the mound in a pile. They kneeled and touched the dirt once more. The game was over, and there was another to be played tomorrow. But as the crowd behind them chanted Fernandez’s name and as the rest of the baseball world kept going, the Marlins stopped to remember a man whom they had loved and cherished. Then they picked themselves up and walked off the field to get ready for the next day, and whatever it might bring.